Strangely, I approach the unboxing of the game with some trepidation. I had heard about WWI and WWII from my father and grandfather, but it was more like a history lesson in class. With the Vietnam War this was actually history I lived, I guess vicariously, through the TV. Growing up in the 1960s, the war was always there. My friends and I rarely, if ever, talked about it, yet its presence was still felt. Some of my earliest memories are of watching the news, and listening to the casualties of the day. Sorry to get so somber. The game and year just brought back memories; back to the game. 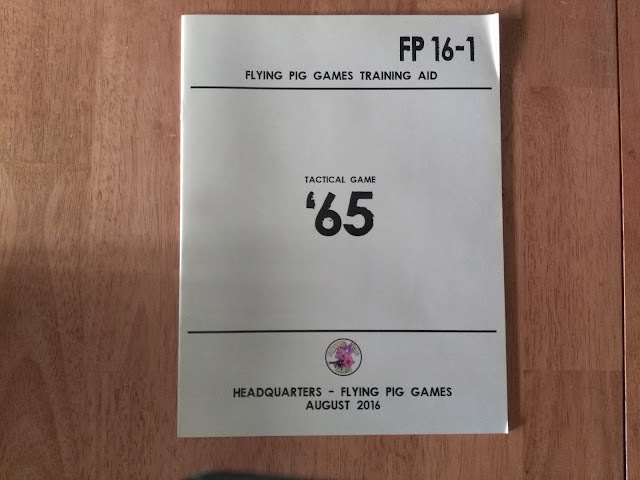 I had reviewed Flying Pig Games Old School Tactical Volume I, and I was very impressed with all of the physical components. In '65, you will be pleased to find out that there is that same attention to detail and high standard of craftsmanship, with one big difference. 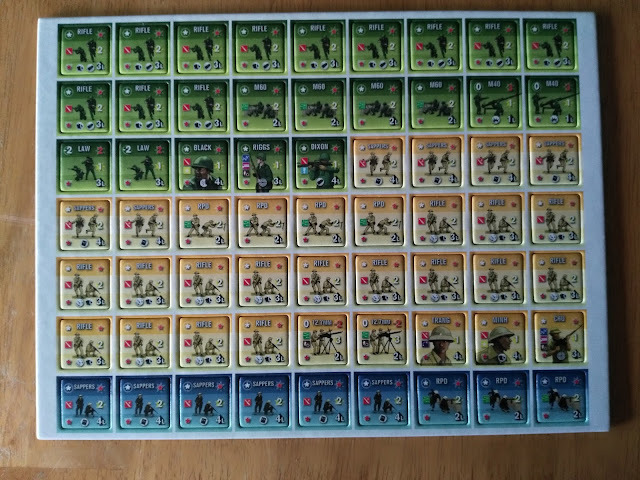 The counters are extra large at 1" X 1.375", and so are the hexes on the mapboards. I cannot thank Flying Pig Games enough for this thoughtfulness. It is almost like they included a fold up walker in the box for us old grogs. 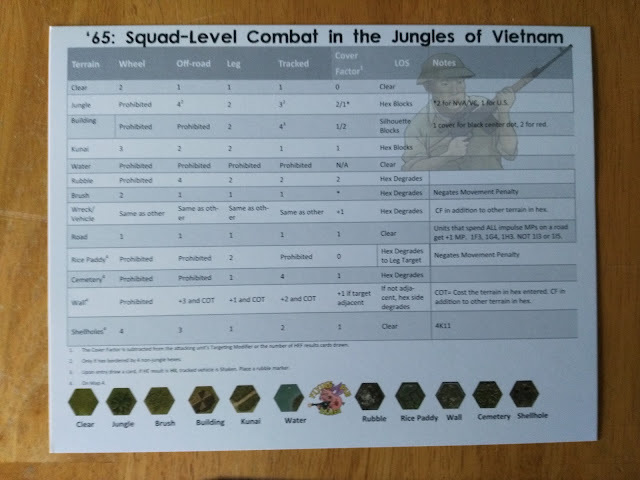 The scale of the game is: squads or gun teams, individual tanks, and snipers. You also get hero or officer counters with bonus abilities. You receive three mounted maps at 11" X 17" to display the flora, etc. of Vietnam. Because of the increased hex size they show less of a battlefield than other games. However, it works just fine for the scale. The 'training aid'/rule book is also top notch. Its size is also in a large enough font for even my wife to read (she edits for me, so rest assured I have been properly chastised). Being a card driven game, it is good to see that they are up to the other components' standards. The game is not only card driven it is all about the cards. There are no dice whatsoever needed for playing. So no plastic was harmed in the games creation. 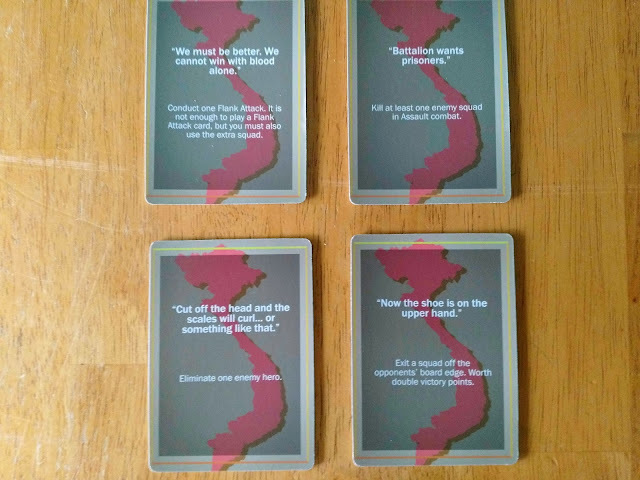 Deal cards: From the shuffled deck each player gets four action cards. Determine initiative: Both players pick one card and compare the 'targeting number' in the lower left block. The player with the higher number wins the initiative, and discards his card. The loser gets to keep his card. Impulse actions: You fill your hands back to four cards. If either player pulls an 'end turn' card, you lay it down (more on this later). 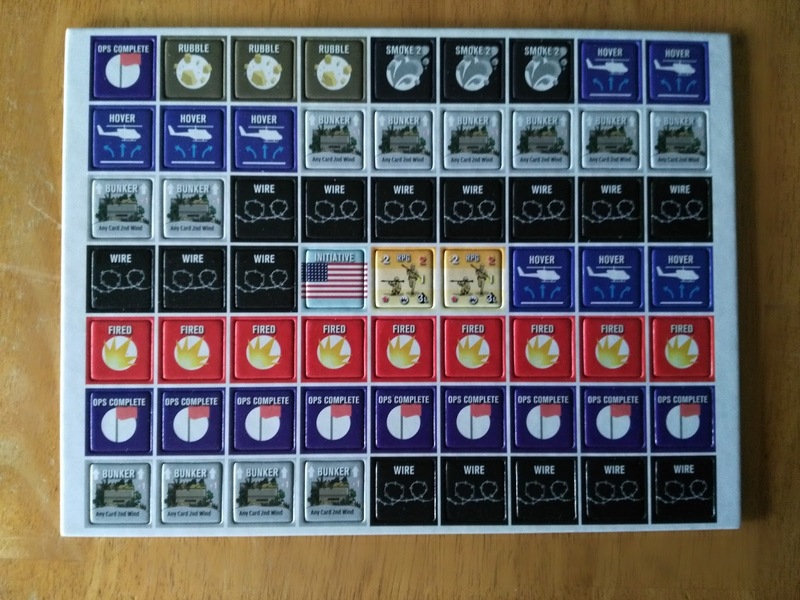 Play: Play cards and activate your units and all other actions. Discard: The players may discard up to two cards. Do nothing and pass: When the scenario's prescribed number of 'end turn cards' have been laid out or both players pass. You then move to the 'reserve phase'. Reserve phase: The player who won the initiative goes first. No cards can be played in this phase. 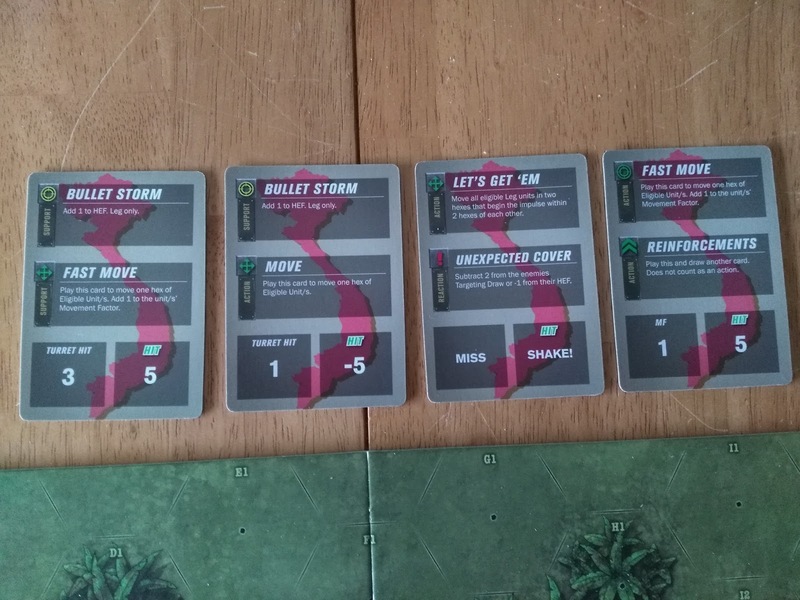 The player who has initiative moves all his eligible units, and then the second players moves his. 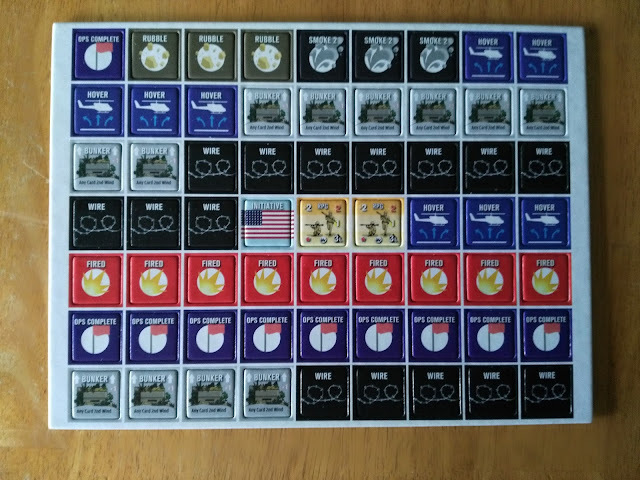 Clean up phase: Fired, moved, and ops complete markers are removed. All 'smoke 2' counters are degraded to 'smoke 1', and 'smoke 1' counters are removed. The shaken markers remain. 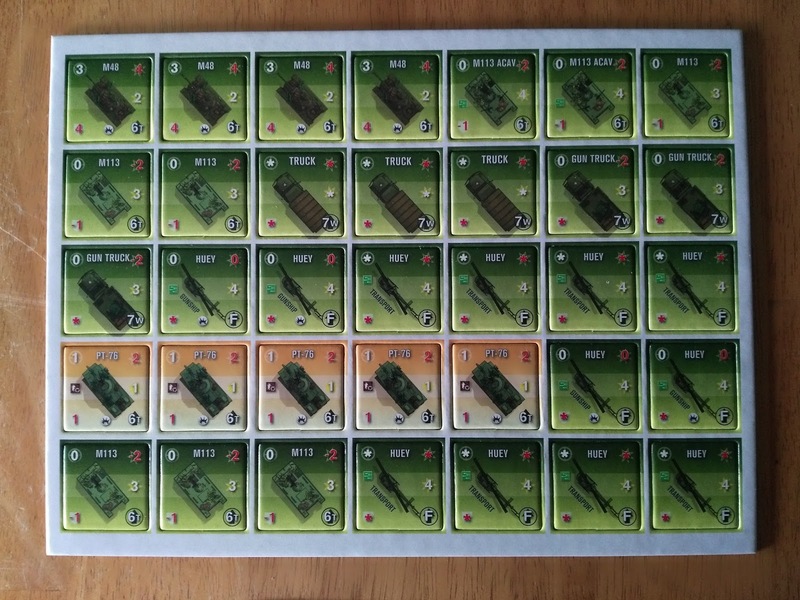 Stacking: No more than three units may stack in a hex. 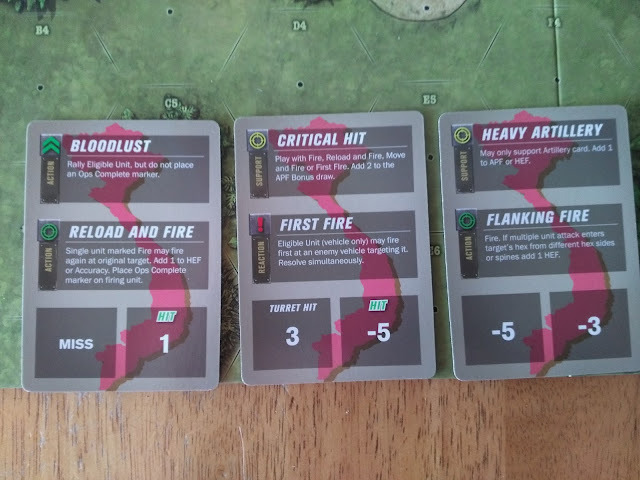 One hero, one vehicle, and two leg units only per hex. The previous was just a synopsis. 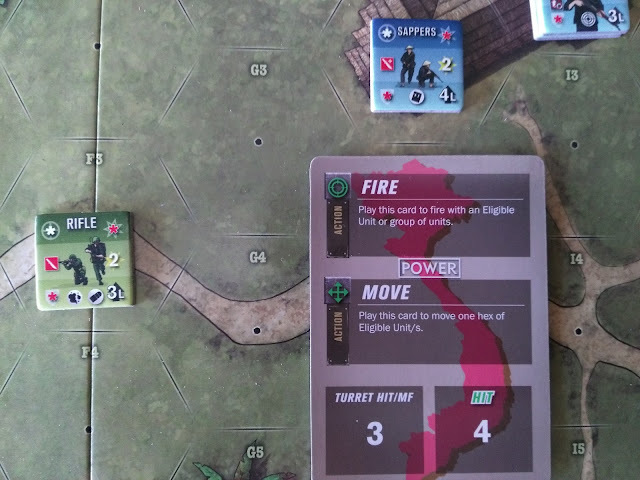 This being the first war where they were used extensively, the U.S. player has helicopter units. They have some unique properties in the game. They are hard targets when they are on the ground or hovering, and they are soft targets when moving. 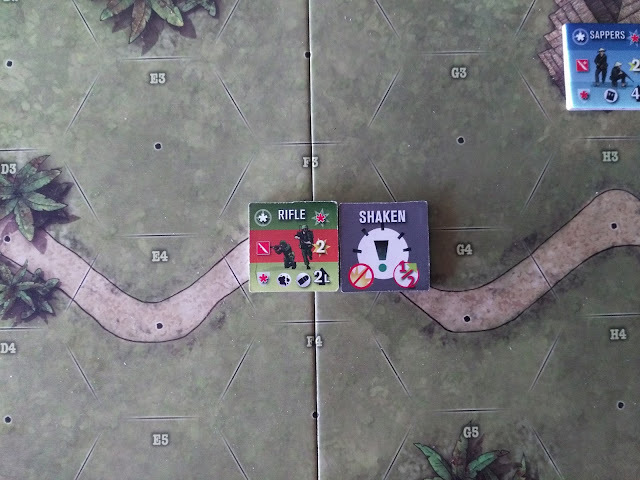 The game also comes with fortifications such as foxholes and bunkers. There are also units that can use satchel charges. The game is completely card driven. Your unit's movement, etc. are all allowed by the cards you have and choose to play. 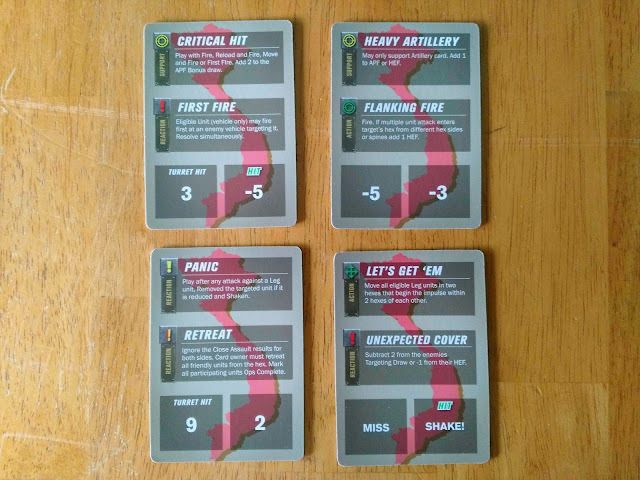 The cards also give you the chance for off-board artillery strikes. Armor and armored personnel carriers are also in the counter mix for both sides. Blood lust: You can rally or reconstitute one eligible unit. Fast move: The unit can get one extra movement factor. 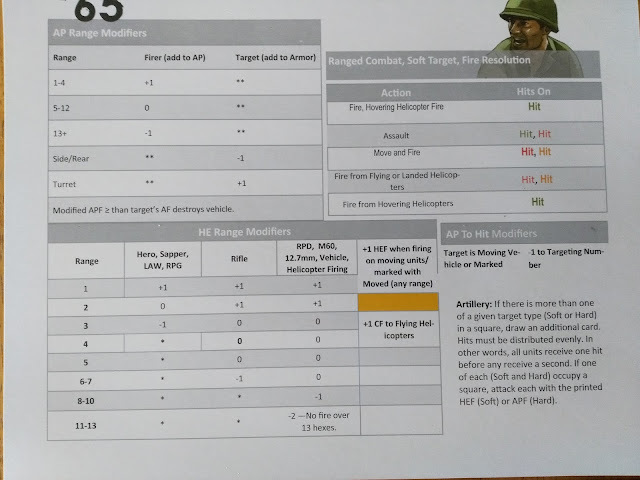 Aimed shot: Add two to a unit's targeting on a hard target. 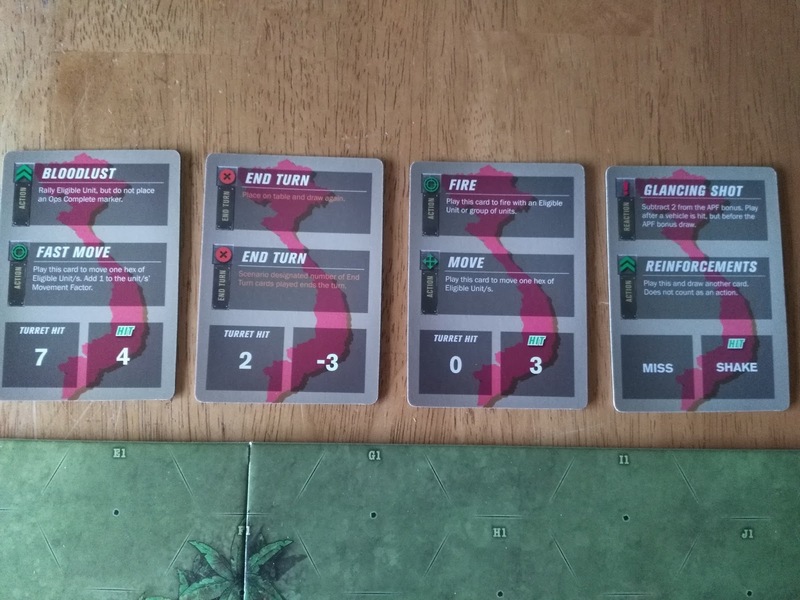 Some scenarios come with the ability for each side to draw a 'bonus victory condition card'. If you draw a card with a condition that cannot be fulfilled (the other side has no hero, etc), then you draw another card. The game play is tense and nerve wracking in a good sort of way. With the smaller scale, and also the small number of units, lady luck can destroy an excellent game plan in a second. The movement, line of sight, and combat mechanics all feel correct for this time of conflict. The rule book is only nineteen pages long, with another eight pages of scenarios (each scenario is one page). As far as the card pulling goes there are times that you will have to pass. Some of the cards are 'vehicle only cards' so if you get one or two in a hand, and you are only playing with leg units, that is a fourth to a half of your hand that turn. As a house rule, some have suggested removing the 'vehicle only cards' from the mix if you are playing with only leg units. This might have been a deliberate decision by the developers, so use at your own risk. 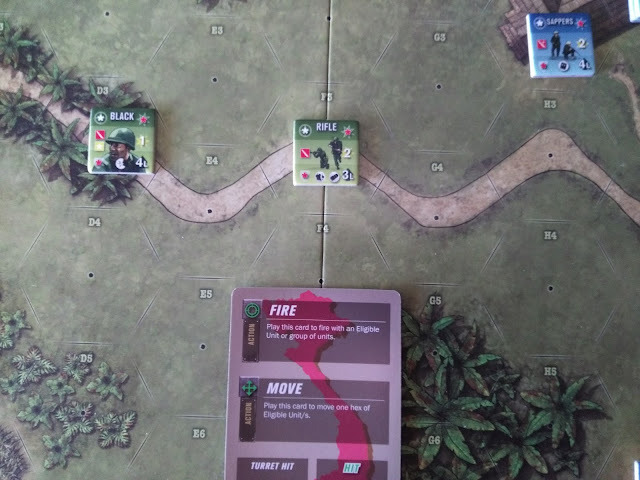 In this play example I have used my card for its 'Move' value, and moved my U.S. rifle squad three road hexes closer to the enemy. My opponent then uses one of his card's 'Fire' value to engage my rifle squad with his sapper unit. When counting the range you include the firing units hex, but not the target hex. So this gives us a range of two. Then you calculate the firing unit's HEF (High Explosive Factor). This is a two for the sapper unit. Next, we calculate the range modifiers which total up to a '+1'. So we now draw three cards (2 +1) from the deck, and consult the 'HE" result in the lower right hand quarter of the cards. The first card gives us a 'Hit' on the U.S. rifle squad. When a unit receives a 'Hit' for the first time, a 'Shaken' counter is placed on it. The next card is also a 'Hit', so the counter is flipped to its reduced side. 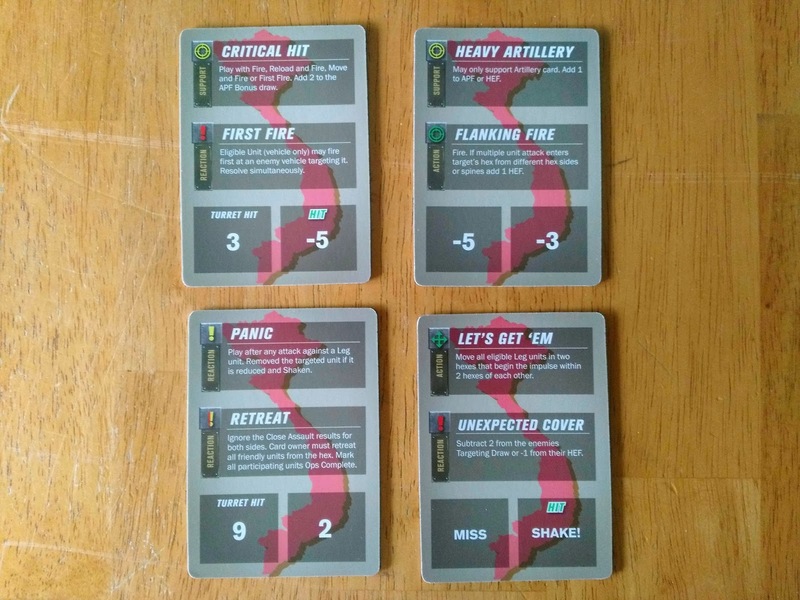 The third card had no 'Hit' value for its action. This is lucky for me because a third hit would have eliminated my unit. The game plays well in solo mode also. 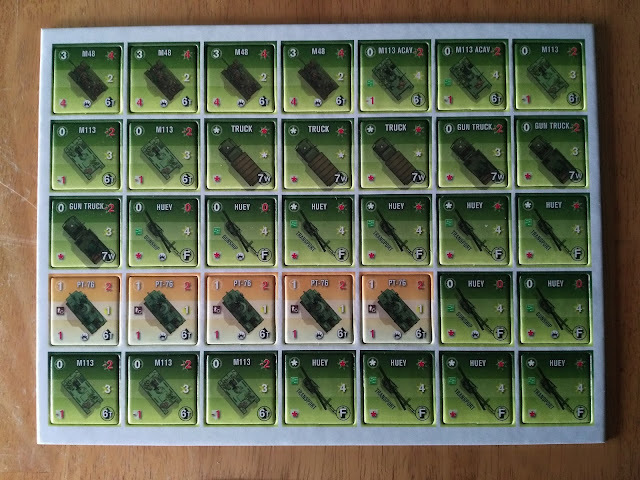 The small footprint and amount of counters in scenarios means that you will not have to take up much space for playing. The game's average time for the scenarios is one to three hours. So you won't have to set it up and worry about small children or animals getting at it while you are at work. With the relatively small amount of rules and all of the player's aids (and ability to read them), makes the game a quick run through after the first few games. 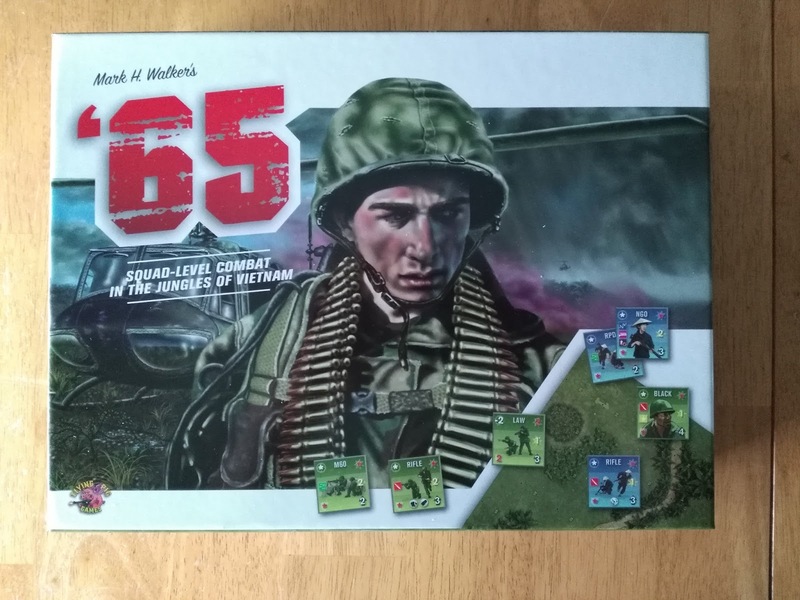 The developers were looking to make a fun quick game on Vietnam warfare, and they have succeeded admirably. Congratulations on another great game, Flying Pigs. As Katherine Hepburn said in 'The Lion in Winter' "there will be pork in the trees come morning". I have always wanted to use that line. Nice review Robert. makes me want to purchase the game. Anyone retailing these in the UK?